My old battery eventually packed it in without notice on Saturday. Luckily I was only a few hundred metres up a small rise from home, so the push wasn't too bad. 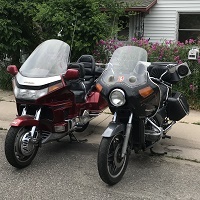 It was a mere 11 years old, and had been powering 'Norma', my '93 GL1500A for all of that time. It was a bright orange 'Odysee', so I managed to get the exact same one locally. A bit pricey at AU $300, but I figure, if this one lasts 7-10 years, I am ahead. One question I have been pondering is - 'While I'm playing with the electrics should I rebuild the alternator'. I have around 90,000klm on the clock. I haven't put the new battery back in yet while I ponder what to do, but will have it in by Saturday for a ride.